The SapTrap-SEC kit contains a set of plasmids for building homologous repair templates that incorporate the Goldstein lab’s self-excising drug selection cassette (SEC), using the Jorgensen lab’s SapTrap cloning method. These plasmids are fully compatible with those from the Jorgensen lab’s SapTrap kit. Plasmids pMLS287 and pMLS288 from the Jorgensen SapTrap Kit will be required for most experiments. Using SapTrap to generate repair templates for SEC selection involves two modifications to the original approach described by Schwartz and Jorgensen. First, an AAG junction is added between the FP and SEC fragments. Together, these two fragments replace the FP/unc-119(+) donors used by the Jorgensen lab. Second, it is important to ensure that a coding exon follows SEC in order to avoid nonsense-mediated decay. For this reason, the NTtag linker is always included in the constructs, even for C-terminal tags. Before using the SapTrap-SEC kit, you should read the papers that established these methods. For background on the SapTrap cloning method see: SapTrap, a Toolkit for High-Throughput CRISPR/Cas9 Gene Modification in Caenorhabditis elegans. Schwartz ML, Jorgensen EM. Genetics. 2016 Apr;202(4):1277-88. PubMed PMID: 26837755. For background on SEC selection see: Streamlined genome engineering with a self-excising drug selection cassette. Dickinson DJ, Pani AM, Heppert JK, Higgins CD and Goldstein B. Genetics. 2015 Aug; 200(4):1035-49. PMID: 26044593. 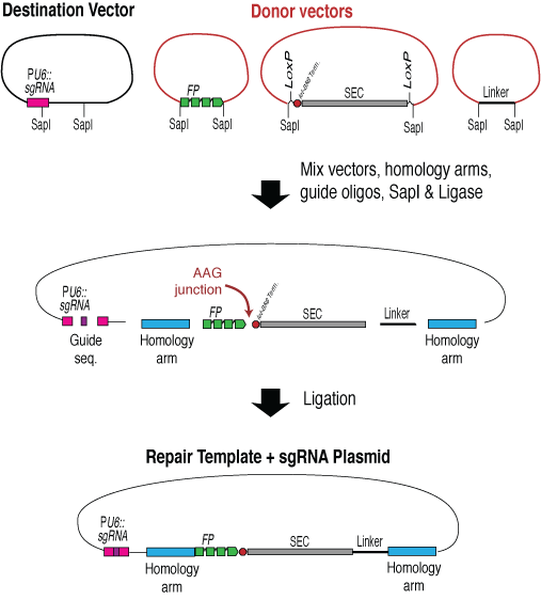 Diagram of the SapTrap assembly process for producing sgRNA + repair template constructs. This strategy was described by Schwarz & Jorgensen (Genetics 2016). The Goldstein lab follows their procedure, the only change being the addition of an AAG junction between the FP and SEC. See the protocol for more details. Up-to-date information regarding this kit can be found at the Goldstein Lab website. SapTrap-SEC kit for C. elegans genome engineering contains 14 plasmids. Please refer to the individual plasmid pages below for more details on each plasmid in this kit. Plasmids pMLS287 and pMLS288 from the Jorgensen SapTrap Kit will also be required for most experiments. These plasmids are not included in the kit and have to be ordered separately.